Get a professionally printed version of this poster for your office or clinic through ShopACNM for just the cost of shipping. CLICK HERE for more information. 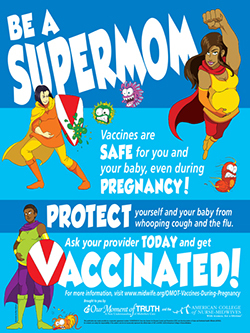 Developed by ACNM through a grant from ASTHO and the CDC, these downloadable resources feature colorful superhero characters and succinct information on the benefits of immunizations to engage your clients. 18x24-inch Be a SuperMom full color poster. Order a FREE printed version in English or Spanish from the ACNM Store. You only pay for $2.50 shipping and handling. Posters are mailed in 1.5 x 18" mailing tubes through USPS. 18x24-inch Be a SuperMom full color poster. Order a printed version in Arabic from the ACNM Store. You only pay for $2.50 shipping and handling. Posters are mailed in 1.5 x 18" mailing tubes through USPS. ACNM created an evidence based curriculum that is free, measured with a pre- and post-test, and a passing score of 80. The curriculum can be found by clicking here. How do I access the webinar? Click here for instructions. Immunization Action Coalition - "Give birth to the end of Hep B"
CDC Content Syndication - The CDC Content Syndication site allows you to import content from CDC websites directly into your own website or application. These services are provided free of charge. Vacunas de inmunizacion - CDC Spanish language site with vaccine information, immunization schedules, videos and e-cards. Patient Brochure on Influenza: This pamphlet was created by Pamela Meharry, PhD, CNM, University of Connecticut, and Marietta Vazquez, MD, Yale University, and is available for public use in English and Spanish. ACNM surveyed its membership in December 2013, and used the survey results to develop materials for midwives, including talking points, and materials for women and their families. About 940 members responded to the survey. Over 80% of the respondents reported that they either screen or provide immunizations to their clients. The biggest information needs identified by the survey include lack of knowledge of the safety of immunizations, talking points for clients, contraindications/indications, updates on the schedule, and the state Immunization Information Systems. Barriers for those not offering immunizations were reimbursement, not enough interested patients, and not enough storage space. This project hopes to address these needs. Following the dissemination of ACNM's influenza and immunization project materials, ACNM members were surveyed a second time in order to gauge the effectiveness of the resources and to gain further insights to improve immunization uptake among women. The final survey was sent out to ACNM members in June of 2014. The results were used to target specific gaps and guide the development of future resources.